* From the Editor- “Alembic Allure” by Luis Ayala. * The Angel’s Share- Featuring Bacardi Pineapple Fusion (70-Proof), review done by Paul Senft and The Lash Spiced Rum (70-Proof), review done by Margaret Ayala. * Mother's Day Special- 4 ways to pamper Mom on her day by Margaret Ayala. * Rum Event- Interview with Mr. Javier Herrera, Director of II International Rum Conference, Madrid, Spain. * Exclusive Interview- Interview with Cellar Master, Mr. Charles Roberts, with La Favorite Distillery in Martinique. 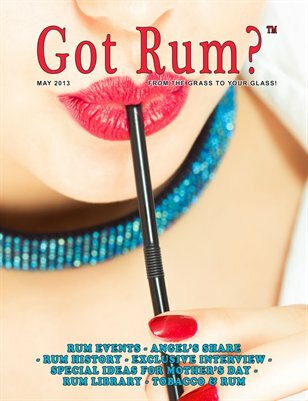 * Rum in History- A timeline of what happened in the month of May throughout history from 1502– 1832. * Rum Library - Review of “Rum & Contemporary Cuisine” written by Carlton Grooms and Geoffrey Blythe. * Pairing Tobacco & Rum –Mr. Philip Ili Barake brings us “The Sweetest Thing”, featuring: Hacienda Saruro Rum Liqueur from Venezuela and a Vintage 2003 Vitola Coronas Cigar by Sancho Panza from Cuba.